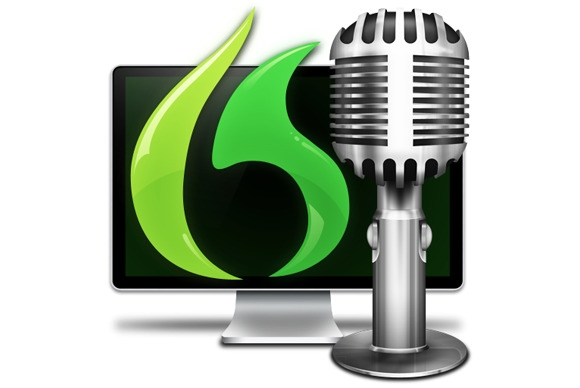 It’s been nearly a year and a half since the last update to Nuance’s speech recognition software, Dragon Dictate, was released. Over the past few years, Nuance has been refining the software, taking it from a pretty good speech recognition app to something one can now rely on. Dragon Dictate 4 is now available, and, while the list of new features doesn’t look impressive, there’s something new under the hood. I’ve seen, over the years, how Nuance has refined and tweaked its speech recognition engine. But with version 4, I now feel, for the first time, that I can dictate without paying too much attention to the words on my screen, and go back and edit after I’ve finished speaking. Recognition quality is radically improved over Dragon Dictate 3. Using SpeechWare’s USB 6-in-1 TableMike, with the boom peeking out below my Thunderbolt display, I’ve been dictating articles and blog posts, and read a number of articles from the Web, using Dragon Dictate 4, and in all cases, the quality of the recognition was excellent. Dragon Dictate 4 looks exactly like its predecessor, but there’s something new under the hood. Not everyone will appreciate some of the new features in Dragon Dictate 4, but if you use Gmail on the Web for your email, a new browser extension lets you manage Gmail using voice commands. Dragon Dictate 4 also lets you mix dictation and editing in Pages 4.3—that’s Pages ‘09, not the latest version. As always, you can dictate into almost any application, but Dragon Dictate works best when you dictate into its own Note Pad; it also works very well with Microsoft Word or Pages ‘09. For all three of these apps, you can dictate and edit without getting the software confused; when you use other apps, if you do any editing, things can get messy. Dragon Dictate 3 added a transcription feature that lets you record yourself on a dictaphone and use the app to turn your voice into words. Dragon Dictate 4 goes one step further, allowing this feature to transcribe any single speaker, after a brief training process. I tried this with two podcasts: one from the New Yorker: Fiction, where Jennifer Egan reads a story by Mary Gatskill, and another from Prairie Home Companion, with Garrison Keillor giving a News from Lake Wobegon monologue. Overall, the results were as expected. The first recording was studio quality, and it features someone reading a short story, slowly and carefully. Dragon Dictate did very well with this, making few recognition errors. For the Garrison Keillor monologue, however, results were poor. There were so many errors that it might take nearly as long to correct them as to transcribe the entire piece. But this was a live recording, with audience laughter at times, and an improvised text. You only need to train 60 seconds of speech to use the transcription feature. The point of this feature is to allow you to record speeches or lectures. So if the speaker is reading slowly, and not extemporizing, you’ll certainly get better results than someone speaking off the cuff, with plenty of “ums,” “ahs,” and repetitions. It would be great if this feature could transcribe interviews. As a journalist, it would be very useful to me to have software that could transcribe several voices: mine and one or more interviewees. You could use Dragon Dictate 4 for this, having the app learn the speech of, say, an interviewee. It would make a mess of your questions, but it would probably save a fair amount of transcription time. But this is a hack, and it would only be useful for long interviews. Perhaps in a future version, Dragon Dictate will be able to handle multiple voices. 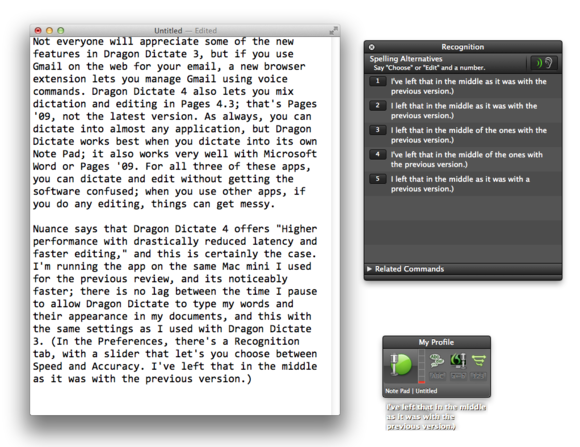 Dragon Dictate 4 is an excellent update to an already good product. If you already use Dragon Dictate, you’ll find that the improved accuracy of the new version makes it worth upgrading. If you’ve never tried speech recognition software, Dragon Dictate 4 is good enough to convince you that you, too, can create documents without typing.